A quick anecdote. While on a road trip last week to Charlottsville I helped introduce my high school history teacher to the magic that is Hamilton. A few days later I received a Facebook message where he asked me if this was in retaliation for the forced repeated listening of Gary Owen when I was in his class. My response: I do what I can. Seriously though, everyone has an opinion about this musical, and I thought it was high time I shared the feelings of others (you know how I feel – in both parody and essay form). I also promise this will be the last post about Hamilton until I see it in August, because I got tickets that didn’t break the bank – Huzzah!. Describe your feelings for Hamilton in one word. Revolutionary. Relevant. Exciting. Inspired. Badassprationalisad. Nifty. Driven. Joyful. What’s your favorite song? When you listen do you listen in order or go straight to a particular tune? Iris: Wait for it. I usually listen in order so it’s like I am listening to the play. Alison: When listening to the music, I tend to jump around to my favorites, Non-Stop, Guns and Ships and Satisfied, rather than go linearly through all the songs. Sarah H.: As for my favorite song, I think I am going to go with It’s Quiet Uptown, because that’s where the soundtrack goes from good to great for me. Up until that point the show is musically exhilarating and intellectually challenging, but not emotionally resonant. It’s Quiet Uptown is pure tragedy, and the show benefits from setting aside Hamilton’s brain for his heart. Sarah F.: My preferred way to listen to the album is straight through, in order. But I don’t always have that much time, of course. I find myself going back to a couple tracks again and again: Guns and Ships, because Lafayette is the best, and the two cabinet battles, because they are so lyrically dense. Kelly: Favorite song? Ugh SO MANY. Right now: musically, I love Helpless. Story-wise, I love The Story of Tonight, Schuyler Sisters, and Guns and Ships (if you have ever met Mark Schneider, Lafayette re-enactor, that song is even more amazing). I tend to listen to it in order. Rob: I can’t listen to it without hearing the opening number, which means I just end up going through it from the beginning. It’s SUCH a strong chorus (can I say that when it’s the ensemble?) especially with the tragic elements. I then have to stay for My Shot, which is probably my favorite though I am not sure. But then I know You’ll Be Back is not that far away, so I stick around for a bit. I feel like You’ll Be Back, Right Hand Man, and A Winter’s Ball are a strong three back-to-back. I guess the [short answer] is that I always start with Alexander Hamilton and end up listening to it in order for as long as I have time. Monty: I like all the little intro songs “how does an orphan immigrant…” and I get Be Enough and What’d I Miss stuck in my head a lot. Why does it resonate with you/why do you think it has made an impact on so many people? Iris (Age 11) drew this during the State of the Union a few days ago. I think its pretty awesome. Iris: It’s unique but familiar at the same time because it’s a rap musical telling a familiar story. The way people relate to it. It is in modern terms and makes it easy to relate to the founding fathers. Alison: Relevancy again. Can you imagine how crazy Lin-Manuel Miranda must have sounded when he was toying with the idea of making an Alexander Hamilton hip hop musical? But it works beautifully! 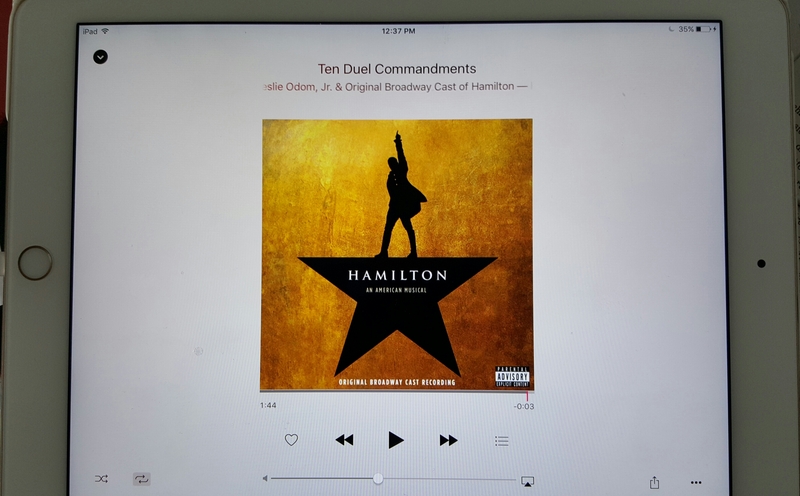 I think that while the story itself is about an outdated [individual] like Hamilton, the hip hop musical elements make it relevant to our time and more engaging especially for younger audiences. Let’s face it, high school students will probably enjoy Hamilton far more than they would enjoy an older musical like Cats (no offense Cats). I think the fact that the subject matter is still relevant, told in a very modern way has helped contribute to its success (Tony Awards 2016!). Sarah H.: I think this is part of so popular and resonates with so many people — it makes history (which is so commonly considered boring) exciting in a way history nerds feel intuitively but most people do not. I also think the choice to cast mostly nonwhite actors makes the story of the beginnings of our country inclusive in a new way, allowing people to see themselves in the Founding Fathers. (I think it was the 60 Minutes episode that included one of the actors saying that nothing in his life made him feel as American as being in the show. That’s powerful stuff.) I also love the gender flip of the “Talk less… Smile more” refrain, as at that time (and uh, often now, still) women were supposed to be the quiet, smiley ones. Kelly: I think it resonates with so many people because it is a very non-traditional medium to depict these events. From my perspective, this is a pretty perfect way to tell this story – these events were very personal and dramatic to the people that experienced them and many people won’t get that from just their history textbook. I also love the diversity of the cast — seeing women and people of color in such prominent roles was very powerful for me. Alex: It makes an important period in American history resonate with people who previously felt no connection to it. Sure, the Revolutionary War was great in that it led to the US. But most of our ancestors weren’t around then. “Hamilton” has themes (immigration, making life meaningful, rising up from nothing) that are hugely relevant today, forging connections between modern and Revolutionary US that weren’t previously there. Monty: I like history, I like badass hip hop, I like this. Megan: I enjoy it as a musical theatre kid first, historian second. I love the wordplay (hello my childhood full of Sondheim and Gilbert+Sullivan!) but I also love that I’ve seen many people pick up the Chernow biography or start browsing FoundersOnline after getting hooked on the cast recording. Renee: Miranda did something innovative in bringing rap to the musical theater format, but not in a way that’s out of the box at all. The bones of the show are closer to Les Mis than anything, which works because everything circles back around, every character has a theme, and they all interact. It rewards the audience in that if you’re paying attention, everything clicks into place in a very predictable and satisfying way. There’s also something to be said for the Hamilton/Miranda parallel, where the energy feels true and real because it is. Non-Stop is autobiographical. This is a show about people who knew they were making history, created and performed by people who know they are making history. Everyone involved (and I’m thinking of Miranda and Odom specifically) has mentioned knowing they were creating a masterpiece, as the show took shape around them. There’s tremendous power in that. So what’s the point of all this? For everyone Hamilton is an inherently personal experience. It hits you cerebrally, viscerally, and emotionally. 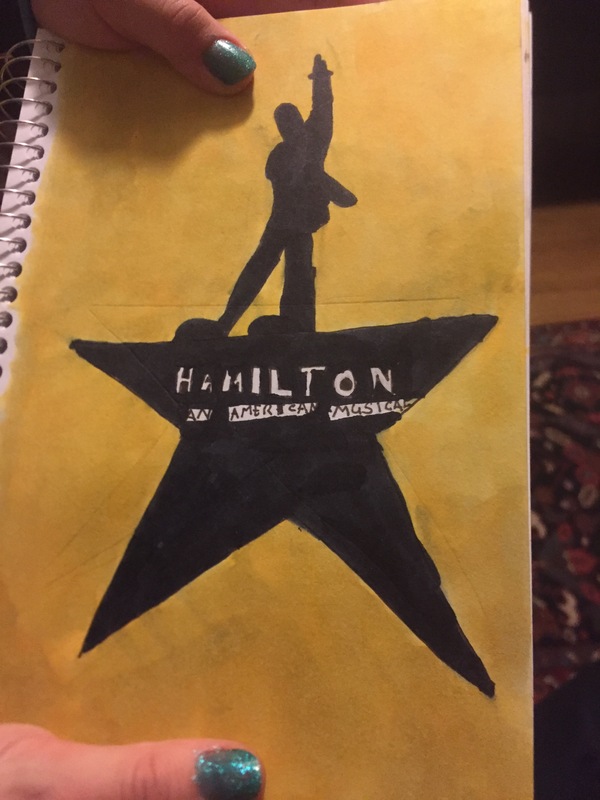 While on the surface Hamilton is a revolutionary show that has broken boundaries — there are, as my friends describe above, very particular and individual reasons why we love it so much. With that I thought I would give Supreme Court Justice Stephen Breyer the last word (from a December interview with NPR).